Estate planning is one of those big tasks that many of us just keep putting off. Even when we know that we need to get to it in order to make sure that our assets go where we want them to, something else always seems to get in the way. In this blog entry, we will talk about three signs that mean it is time to stop procrastinating and make a plan. If you would like to speak with an attorney who has dedicated their practice to helping people protect their assets and plan their estates, contact us at Safe Harbor Wills & Trusts in Watertown. While most attorneys can probably offer you some level of assistance, it takes a truly experienced and knowledgeable estate planning attorney to help you create a will or trust that will most closely follow your last wishes. Call us today and set up an appointment. We talk to a lot of people who believe that they don’t need to have a will or any other kind of estate planning because they are not wealthy. While wealthy people tend to take advantage of estate planning more often than people with less money, it does not mean that even those with modest incomes shouldn’t be prepared. Even if you don’t own a home or many items of much value, when you have children you want to make sure that they receive everything that you would like them to have. A will is the absolute minimum that you should have once you have children. A will is a legal document that clearly states how you would like your assets divided. Without a will, your spouse and your children will have to wait for your estate to go through the probate process before these assets will be distributed. Probate can be a protracted process even if you do have a will, so make sure to remove as many speed bumps as possible in case you pass away unexpectedly. A will is not a “one-and-done” document, however. As you age and accumulate more assets, your will must be updated in order to account for new assets. It is a good rule of thumb to have your will updated any time you undergo any large change of life — the birth of a new child, a marriage or a divorce, receiving an inheritance, buying or selling a home or business, etc. Starting or buying a business is one of the toughest and most rewarding challenges you can undertake. While you will undoubtedly have hundreds of other things on your mind while you get your new company off the ground, estate planning should be towards the top of your list. Without proper legal protections, you could lose everything you have worked for if someone files a suit against you. An estate planning attorney can help you determine the best way to make sure you are protected. While everyone will pass away eventually, some people have factors in their family backgrounds that may lead them to believe that they could fall victim to certain ailments and conditions that diminish their capacity to make decisions for themselves. Neurological disorders like Alzheimer’s and dementia are not only difficult conditions to deal with, they can make it nearly impossible for you to make legal decisions once you have been diagnosed. An important part of estate planning for those who are at higher risk of these kinds of impairments may include creating a document that gives power of attorney to a family member or trusted friend. 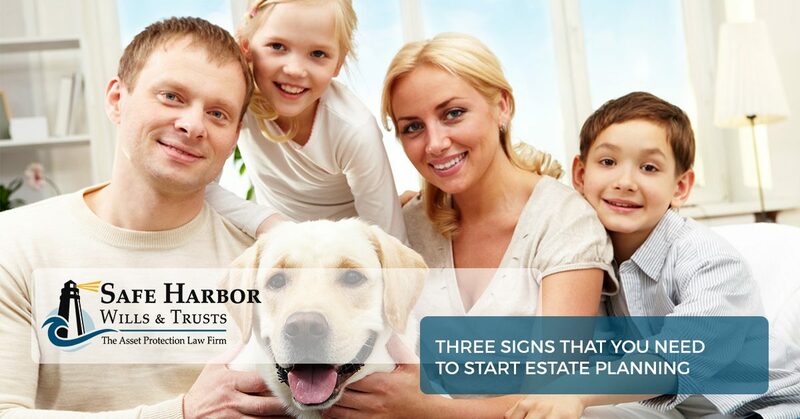 Contact us at Safe Harbor Wills & Trusts in Watertown today to learn more about our estate planning and asset protection legal services. We are also here to help you with any elder law emergencies.